Hydraulic drives are gearboxes connecting power source and hydraulic pumps in hydrostatic drives. They are also called fluid drives. In hydraulic drives, there are two methods of hydraulically varying the speed of the driven load when the driving motor is operating at a constant speed, fluid coupling and hydraulic pump and motor. Individual Hydraulic Drive : Operates in a closed system. 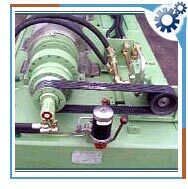 Direct Drive Hydraulic Drive: Supplied from power packs delivered with the winches. Central Hydraulic Drive : Supplied from ship's hydraulic central system. All applied elements of fluid drive is of marine make suitable for sea weather conditions. Hydraulic installation mounted on winches is terminated with fittings or flanges enabling connecting of winches to ship's piping. The hydraulic installation on the winches can also be made of stainless steel. Hydraulic drives are often better for more heavy duty processing. They are also better for processing materials that experience frequent overloads from batch feeding. They offer better shockload protection from non-shreddables and allow more precise particle size control. If some shock hits the system, fluid hits a release valve and bypasses the system. Fluid drives are an attractive and cost efficient proposition when two or more winches are to be power driven. They have wider applications in cranes, deck machinery, ramp winches, thrusters, drilling, anchor winches, auxiliary winches, trawl winches, dredging and also for steering of luxury cruisers. Low inertia and instantaneous response makes hydraulic drives perfect for feeders and conveyor belts where rapid fluctuations in load can lead to costly breakdowns.